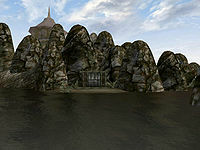 Sinsibadon is a small slaver's cave on an island directly east of Ald Sotha. The entrance is located on the northeastern shoreline facing the water. Three pirates and a pair of nix-hound guard six slaves. They are led by Herd, formerly known as Herd the Bandit and now known as Herd the Pirate. Borug gro-Lazgarn carries the slave key to free the slaves. The loot on the bandits is comparatively mundane, as are the contents of the few containers in this cave. There is little of distinction to be found here. 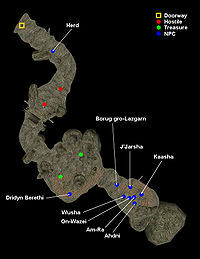 The Dwemer ruin of Mzahnch and the Mudcrab merchant are nearby. This page was last modified on 27 October 2018, at 04:27.